I was preparing for PSPO certification. Eric Ries’ Lean Startup is a recommended reading for the Product Owner Role. I read the eBook and listened to the audiobook from Scribd. <– Using the link, you should be able to get unlimited access for 2 months. This is enough to download, read, and listen to available resources on your Product Owner journey (or on any topic for your reading pleasure). Scrum is done better when the product owner role acts as the Mini-CEO. The product owner is the entrepreneur, she is the owner of the business, and she assumes full functional and budgetary responsibility for the product. The Product Owner makes decisions on where the product is heading, whether to pivot or persevere based on validated learning. Every Agile Team needs to know what their customers want. Without validated learning, Product Owners are dealing with assumptions. It is likely that the team will give the market something it doesn’t want. Product Owners must have the ability to listen to customers in order to identify wastage and eradicate it. The Product Owner in the Lean Startup context needs to drive the business from extreme uncertainty. Product Owners are not always handed with complete specifications and product backlog on a silver platter. Oftentimes, Product Owners need to discover these conflicting needs and wants themselves. Even the customers do not know what they want until they see the product in front of them. In uncertain conditions, general management tools will not work that well. There is a need to frequently change forecasts, yearly budgets, product milestones, detailed business plans as we adapt from the changes to the business environment. 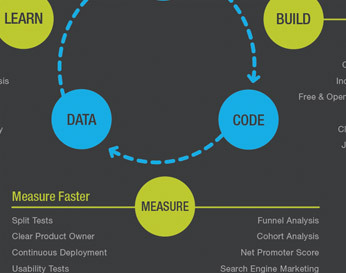 Similar to Scrum, Lean startup approach is empirical. It is about experimentation; testing predictions and learning what works or doesn’t. The Product Owner should be ready to navigate the Scrum Team in these uncertain conditions. Every business organization eventually faces an overriding challenge in developing a product: deciding when to pivot and when to persevere. It is answering the tough question: are you making sufficient progress to support your strategic hypothesis, or do you need to make a major change? It is best that you are prompted with these questions earlier on. 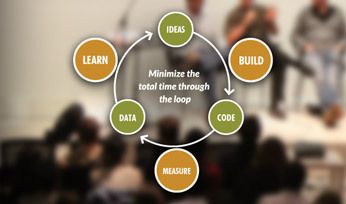 The Lean Startup puts emphasis on Validated Learning as a measure of success. To validate these assumptions, there is a need to release the product as quickly as possible. There is a need to conduct experiments and apply genchi genbutsu — go and see for yourself. As an example, even with an unfinished form of Facebook, the amounts of time people spend on the site were impressive thereby ratifying the value hypothesis. And because users were increasing, the growth hypothesis was also validated. a) Do customers recognize that they have the problem you are trying to solve? b) If there was a solution, would they buy it? c) Would they buy it from us? d) Can we build a solution for that problem? Rather than paying extensive market research, or spending too much time in developing business plans, the Lean Startup approach is to learn what customers want (and don’t want) by carrying out experiments that provide validated learning. Lean Startup encourages the team to deliver MVPs (Minimum Viable Product) and sell it to early adopters. MVPs deliver faster by delivering less. This will mean story slicing to the extreme. It may mean worrying about exception cases later and supporting single vendor at first and scale later. An MVP can be in a form of a video that you could share. The video can describe what your end product will do. The video share can be used to solicit feedback or even book advance orders. A concierge MVP, on the other hand, focuses on one customer to offer services to and solicit feedback from. Once that customer’s problem is resolved, you then invest in automating that solution and scaling it up to the broader customer base. Most business and development team dramatically overestimate how many features are needed in an MVP. When in doubt, the author suggests simplifying. The recipe for success is to fail fast and fail often. In faster release cycles, you’ll get to see all your mistakes as you figure out how best to deliver. As long as you have the tolerance for it, it will be able to get you a better product sooner. Building an MVP is not without risks. Getting an early prototype product out into the marketplace will conflict with your goal to build a high-quality product. Although this may be true, remember that until you really know what customers want and will value enough to pay for, you don’t yet know what quality is. The Lean Startup Product Owner must be willing to set aside their traditional professional standards to start the process of validated learning as soon as possible. The Product Owner must be willing to empirically test predictions and learning what works or doesn’t. Fall quickly and rise again. Most businesses are caught off guard by their later failures, not knowing how to respond or even rise again. Validated learning and experimenting help avoid this. One may argue that working on big batches will improve overall functional efficiency. Indeed working on specific functional task will make one faster in that job but may not be true when the overall end-to-end flow is taken into consideration. In the book, the author compared the performance of folding 100 letters and stuffing them into envelopes. The task consists of folding letters, addressing, stamping, putting letters in envelopes and sealing. Performing these tasks one letter at a time was faster overall compared to performing them in large batches (fold all paper first, put address stickers to all envelops, etc.). Issues such as incorrect paper size, non-sticking envelop or stamp, are discovered earlier and corrected faster. Compared to a large batch of folding, rework is not costly. A. Are the business assumptions correct? B. What will be our key drivers of growth? C. Is our business model sustainable? Oftentimes, Product Owners choose to measure what the author calls Vanity Metrics, these are metrics that may look nice on charts but does not actually mean anything. For example, a number of registered users, compared to a number of profitable customers, growth in registered users may not directly indicate the three learning milestones above. A. Actionable – it demonstrates a clear cause-and-effect. Actions that led to the metrics can be replicated. B. Accessible – it is available for everyone to see and is simple for everyone to understand. It can be used to make decisions in the future. Experiments should be measured against agreed 3A metrics to assess their impact on the learning milestones. Working on small batches, building and measuring immediately enable this learning. The author suggests running multiple experiments at the same time using A/B or split testing. Split test results are traceable to which experiment resulted to which customer behavior. This enables the team to deploy only the successful experiments to the mainstream. Andon Cord – stop production so that production never has to stop. It refers to a system to notify management, maintenance, and other workers of a quality or process problem. It forces everyone to stop and fix the quality problem before it accumulates. Quality is not traded with time. 5 Whys (root cause analysis) – continuously asking why to a problem until the root cause is identified. Cause-and-effect relationships underlying a particular problem can be traced. It effectively solves the problem by eliminating the root causes. It prevents the problem and the immediate symptoms from recurring. Common pitfall to 5 whys are the 5 blames. Instead of constructively and collaboratively developing solutions, people may start pointing fingers on who to blame. To avoid this, everyone affected by the problem should be present during the analysis. Assigning Change Masters – the change masters are responsible for making sure root cause analysis is performed and that the action to resolve the root causes are carried out. A change master is senior enough to have authority to ensure actions are performed but not senior enough that he will not be available to oversee the changes. Suitable and sustainable processes are those defined by the team and are tailored to their specific condition. These processes evolve to meet the needs of changing conditions. When companies become larger, they seem to lose the capacity for innovation, creativity, and growth as processes and hand-offs keep on piling. So how would one nurture innovation within an existing team or organization? A. Create a platform for experimentation, a safe space for innovation called the innovation sandbox. The sandbox should protect the parent organization from any failed experiments as it will focus on a single or small batch of product changes to the selected customer segment. B. Establish a cross-functional team to incubate innovation. You may choose to get representatives from existing Scrum teams. D. The Product Owner should have a personal stake on the result of the experiment and the team must be held accountable for its results. Successful innovations should be fed-back to the main product or may branch-off as a separate product. All the Lean Startup ways presented in the book encourages companies to cultivate innovation and to avoid waste in its operation. Our current problems are caused by trying too hard at the wrong things. As Peter Drucker once wrote, “There is surely nothing quite useless as doing with great efficiency what should not be done at all.” The sooner we know that we are doing is not what our customer wants, the earlier we can pivot and build a sustainable organization/business. I end this summary by how Lean thinking defines value: value is providing benefit to the customer; anything else is waste. When taking a Product Owner role, remember the 7 Learning Backlogs above from the Lean Startup. Let’s keep learning. Planning to get certified as Scrum Professional Product Owner? Check my PSPO reviewers.